One of the most anticipated events for 2018 in the crypto community is the decision on the Bitcoin exchange-traded fund (ETF) application. So far, the US Securities Exchange Commision (SEC) has rejected 9 ETF proposals, simply because of the fact that ETFs can be subject to manipulation. However, the Director of Digital Asset Strategy at VanEck’s, Gabor Gurbacs, made the bullish prediction during an interview with CNBC Crypto Trader hosted by Ran Neuner, and then explained what ETFs could bring to Bitcoin and the crypto space at large once it is successfully launched. Our gold ETFs are already in a few billion dollars range. There are gold ETFs in the $10 billion range as well. I wouldn’t be surprised if a bitcoin ETF gets in a few billion dollars range. Out of the 9 Bitcoin ETF applications rejected till date, only the one filed by VanEck-SolidX duo has been allowed for a review, with the response which is likely to arrive by December 29, 2018, or February 1, 2019. What sets our ETF apart,” he explained, “is that it’s a physical bitcoin ETF. So, it stays true to the bitcoin you own in underlying. It’s fully insured so if there is any theft, hacks or losses; then the insurance covers it. The pricing that we use for bitcoin comes from our indexing subsidiary. It is a regulated entity which provided the first financial standard and regulated indices. The ETF is institutional-oriented, so we have a cap of 25 bitcoins per basket. Last week, the BTCUSD pair continued in a bullish trend. The flagship cryptocurrency faced resistance at the $6,600 price level and shortly after that, virtual coin plummeted. It was suggested that if the price of Bitcoin broke the $6,400 level, it would slide into the critical support level. However, the crypto’s price dropped on November 9 to the $6,418 level and then started a bullish movement. The bulls, however, restrict the bears from entering at the lower level of the price range. If sellers, on the other hand, gain control, the BTCUSD pair will find support at either $6,200 or $6,000 region. 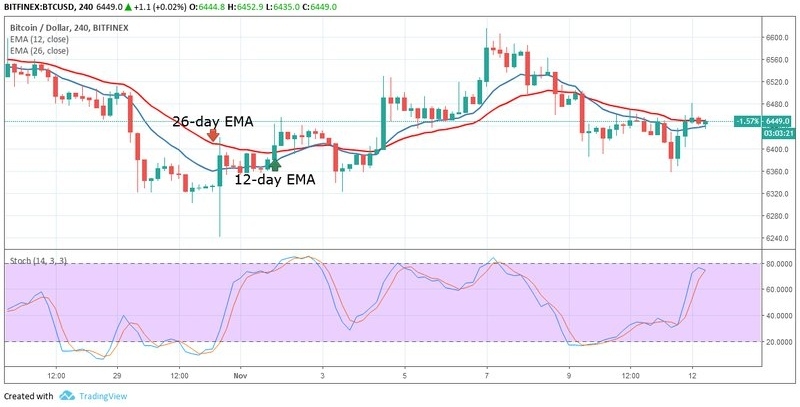 Still, from the price action, the BTCUSD is below the 12-day Exponential Moving Averages (EMA) and the 26-day EMA which shows that the price is in the bearish trend zone. Moreover, there is a possibility that the pair will retest the lower level of the price range. The Stochastic indicator which is in the range above 40 shows that the momentum is increasing on the upside. In the meantime, the 4-hour chart shows that Bitcoin price is in a bullish trend. The Stochastic also is in the range below 80 also shows a buy signal and the momentum of price is increasing on the upside. Moreover, Bitcoin price is still below the 12-day EMA and the 26-day EMA, thus indicating that the price is in the bearish trend zone.